Welcome to the eBasketballCoach members area! Below you'll find all the products that you currently have access to. Simply click the product name and you will be directed to a page where you can download the files or stream the content over your Internet connection. Access 205+ championship-tested drills, plays, and motivational strategies from world-class coaches like Hubie Brown and Tara VanderVeer. If you need any assistance with your material, use the Live Chat widget on this page. Or contact us by email and we'll respond within one business day. If the products you purchased are not showing up above, you can also access them in your "My Account" area. Limited time offer for new customers. 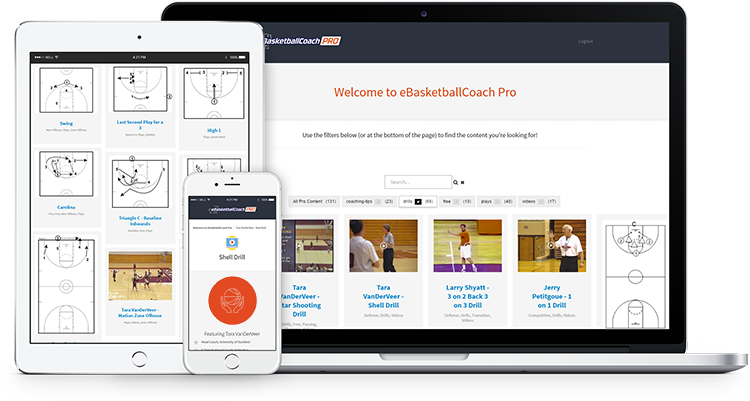 You're invited to receive 117 brand new basketball coaching drills... for just one dollar! Click here to learn more. If you’re enjoying these resources and want to see more, check out our basketball coaching catalog for a complete listing of recommended books and videos.